In September 1991, a 72-foot “long-liner” sailed from Gloucester, MA on its last sword fishing run of the season to Newfoundland’s Grand Banks. Its crew of 6 were all experienced fishermen. Like most fishing boats at the time, the Andrea Gail had a fax machine on board to allow them to track the weather. However, given that they were days away from the nearest port, the best anyone on the Grand Banks could do with a poor weather report was to use the information to ride a storm out as best they could. 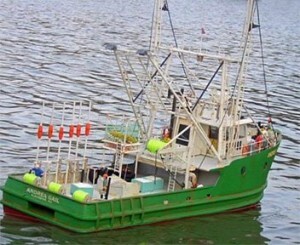 In advance of a storm, fishermen pull in their lines (a lost line is a significant expense while lines left out can endanger a ship) and secure equipment (both to prevent its loss and to prevent injuries). If they can’t make safe harbour, they can try to make for cooler waters, as hurricanes and similar storms need warm waters to sustain their energy. A monster storm began brewing on October 26, with three weather systems set to converge on the North Atlantic: a cold-weather front moving south from Canada, a Great Lakes storm moving east, and Hurricane Grace moving north. The Andrea Gail was on its way home when its captain, Billy Tyne, received a fax with the details of the impending weather the night of October 27. He spoke by radio with Linda Greenlaw, captain of the Andrea Gail‘s sister ship, the Hannah Boden. Although Billy and Linda knew that the weather didn’t look good, Billy must have decided to ride the storm out as he had done many times before. But with the convergence of three different storm fronts, this was no ordinary storm. Not only was it immensely powerful, but it lasted days. At about 6:15pm on October 28, Billy Tyne radio’d the remainder of the fishing fleet to say, “she’s comin’ on, boys, and she’s comin’ on strong.” That was the last that anyone heard from the crew of the Andrea Gail. No one knows exactly what happened to the Andrea Gail. It’s possible that the 72-foot boat was overwhelmed by waves that, in places, reached 100 feet in height. Or she might have crashed on the shoals of nearby Sable Island, off Nova Scotia. The only trace of her ever found was some debris floating on the water’s surface. Author Sebastian Junger later documented the story of the Andrea Gail in his book, The Perfect Storm (W.W. Norton 1997). The book was then adapted into a film by the same name starring George Clooney. Linda Greenwall is an author in her own right, and has documented her life as a long line fisherman. Masefield, John. 2000. “The Perfect Storm: The Andrea Gail, Awesome Stories. Available online [with excellent links providing details and images]: https://www.awesomestories.com/asset/view/Perfect-Storm-The. Accessed Mar 22, 2016. “The Andrea Gail” [a timeline of events around the time of the boat's disappearance]. Available online: http://www.downtosea.com/1976-2000/angail.htm. Accessed Mar 22, 2016.